After sampling the early part of Stephen King's career last year with The Long Walk, I thought I'd see what he was up to these days. 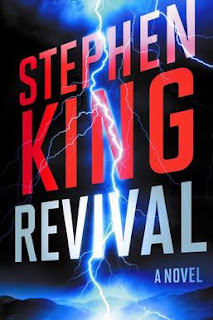 As it turns out, I found Revival (2014) to be an entertaining but curious and mismatched beast of a book. King is trying his hand here at a story in the idiom of H P Lovecraft, slowly building up to full-on, drawing-back-the-cosmic-curtain, scientific horror. The kind of story which suggests that looking beyond the limits of what is knowable is a bad, bad idea, both for the protagonist and for humanity at large. But this aim is a poor fit with King's usual strengths as a writer, particularly his investment in character, in everyday America and in the psychogeography of his home state of Maine. All of these are on lengthy display in Revival's early and middle sections. Many of the best scenes in the book come from the interaction between our narrator Jamie Morton and his friends, family and colleagues, as he meanders (like the text) through his life. Even his friend and adversary, defrocked pastor Charlie Jacobs, is much more convincing as teacher or as grieving widower than the tragic scientist/occultist he eventually becomes. This means that the shift in the later sections of the book to a Lovecraftian mode - although well foreshadowed - is somewhat jarring and does not bring with it a corresponding Lovecraftian mood. King's humanistic sensibilities, so well presented earlier, make it difficult for him to carry off the full-throated anti-humanism required for the exercise. Anger at the unfairness of the world and unreasoning faith, and at the unwillingness of people to face up to this, King can do with knobs on. With spoilering you, Charlie Jacobs' so-called 'Terrible Sermon' - his resignation speech from the pulpit - is one of the best uses of dramatic monologue in modern genre fiction I can recall reading. But this comes from a place of anthropocentric outrage in a way that Lovecraftian coldness simply doesn't. And structurally, I suspect that the accumulation of human detail King provides in the build-up detracts from the inhuman horror of the climax. Would a short, sharp novella have been a better treatment of the core material? Perhaps. Lest you think I'm damning Revival overmuch, let me say that it's never less than readable and parts of it are very good indeed. And the fact that SK is still trying to pull off work like this around forty years into his writing career, rather than resting on his laurels, speaks highly of his continued creativity. I agree with your review. This book is so different from what his stories used to be like - and not in a good sense, I think. Like you mentioned - Jacobs didn't seem believable and I think crafting believable and deep characters used to be a major trait in Stephen King's writing. Thanks! I'm very much a latecomer to King so I genuinely don't know what to expect when I pick up one of his books.